Thomas Keller is a famed Napa Valley chef and restaurant owner. And the author of the recent New York Times bestseller "Ad Hoc at Home." From April 8-11, he'll take part in California's Pebble Beach Food and Wine Festival. Keller has participated in this festival for a number of years, and in it, the crème de la crème of the culinary world assemble to give culinary demonstrations and to taste wine while playing some great golf. When Keller goes to Pebble Beach, he likes to emphasize local ingredients, and one of the real specialties of the area is garlic. Garlic, Keller says, has many uses, from roasted garlic to garlic confit, and works in a variety of dishes, from pastas to salads. Skirt steak, part of the diaphragm, is a very flavorful cut. There are two sections of the skirt, an outside muscle and an inside muscle. The inside muscle is smaller, a little more uneven, and a little tougher than the outer skirt, which we prefer. The outer skirt is still a tough cut of meat and, because it's served medium-rare, not tenderized through long cooking, you need to slice it across the grain, straight down (thereby shortening the long muscle fibers that otherwise make it tough), to ensure that it's tender. The marinade we use here, with abundant herbs and garlic, is excellent for all cuts of beef. Combine the thyme, rosemary, bay leaves, peppercorns, garlic, and oil in a medium saucepan and bring to a simmer over medium heat. Remove from the heat and let the marinade cool to room temperature. Pull away the excess fat from the skirt steak and discard. If necessary, trim the steak of any silverskin. Cut crosswise into 6 equal pieces. Put in a dish or a resealable plastic bag, add the marinade, and cover the dish or seal the bag, squeezing out excess air. Marinate for at least 4 hours, or for up to a day, in the refrigerator. Remove the meat from the marinade and let sit at room temperature for about 30 minutes before cooking; discard the marinade. Dry the meat with paper towels. Season with salt and pepper. Preheat the oven to 350°F. Set a roasting rack in a roasting pan. Heat some canola oil in a large frying pan over high heat. When it shimmers, add half the meat and quickly brown the ﬁrst side. Turn the meat and, working quickly, add 1 tablespoon of the butter, 2 thyme sprigs, and 1 garlic clove and brown the meat on the second side, basting constantly; the entire cooking process should take only about 11/2 minutes. Transfer the meat to the rack and spoon the butter, garlic, and thyme over the top. Wipe the pan and repeat with the remaining steaks. Transfer the baking sheet to the oven and cook for 8 to 10 minutes, or until the center of the meat registers about 125°F. Remove from the oven and let the meat rest on the rack in a warm place for about 10 minutes for medium-rare. Arrange the steak on a serving platter, or slice each piece against the grain, cutting straight down, and arrange on the platter. Garnish with the garlic and thyme. Cut off the ends of the cucumbers and peel them. Seed the cucumbers if desired: cut the cucumbers lengthwise in half and use a small spoon to scrape out the seeds. Cut the cucumbers into half rounds, or into rounds (if you didn't seed them), batons, wedges, or any shape you like. Combine the vinegar, oil, red pepper, and sugar in a small bowl, stirring to dissolve the sugar. Season to taste with salt and pepper. 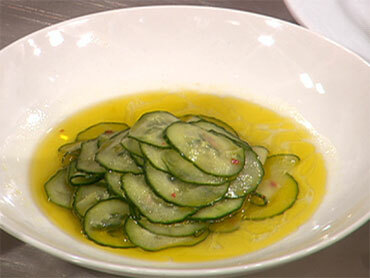 Put the cucumbers in a canning jar or other storage container and pour the liquid over the top. Refrigerate for at least 1 day, or for up to 2 weeks. Before serving, remove any solidiﬁed oil from the top of the liquid and discard. Serve cold. For more recipes, go to Page 2. My fondness for this American classic is so well-known that my French pastry chef at per se created a four-star version. But here's a simple version that's hard to beat. You can use any kind of cookie and any kind of ice cream. Simply spread the soft ice cream on a quarter sheet pan and freeze it until firm, then use the same cutter you used for the cookies to cut out squares or rounds of ice cream and sandwich them between the cookies. Kids love this, but it's also a fabulous adult dessert. You can use just one kind or a variety of ice cream flavors and cookies. Some of our favorite combinations are Chocolate Chip Cookies (page 326) with Vanilla Ice Cream (page 319), Chocolate Shortbread Cookies (page 327) with Mint Chocolate Chip Ice Cream (page 320), and Linzer Cookies (page 331) with Chocolate Ice Cream (page 319). Line a quarter sheet pan with a piece of plastic wrap, leaving an overhang on both long sides. Spread the ice cream in an even layer in the pan. Fold over the plastic and freeze until ﬁrm. Lift up the edges of the plastic wrap to remove the ice cream. Have a bowl of hot water at your side. Using the cutter you used to make the cookies or a knife, cut squares or rounds of ice cream slightly smaller than the cookies, dipping the cutter or knife in the hot water and drying it with a towel before making each cut. Assemble the sandwiches and serve immediately, or wrap in plastic wrap and freeze for up to 3 days. Pour the milk and cream into a large saucepan, and add half cup of the sugar. With a paring knife, scrape the seeds from the vanilla bean, if using, and add them to the liquid, along with the pod. Or stir in the vanilla paste. Bring to just below a simmer over medium-high heat, stirring to dissolve the sugar; a skin will form on top and the liquid should just begin to bubble. Remove the pan from the heat and let steep, uncovered, for 20 minutes. Remove the vanilla bean from the pan, if you used it. Return the pan to the heat and heat until the milk is just below a simmer. Meanwhile, whisk the remaining 6 tablespoons sugar and the yolks in a bowl until slightly thickened and the whisk leaves a trail. Slowly, while whisking, add about half cup of the hot milk mixture to the yolks, then whisk in the remaining milk mixture. Set a ﬁne-mesh basket strainer over a clean saucepan and strain the liquid into the pan. Prepare an ice bath in a large bowl and set a medium bowl in the ice bath; have a strainer ready. Put the saucepan over medium heat and cook, stirring constantly and scraping the bottom and sides often with a wooden spoon, until steam begins to rise from the surface and the custard thickens enough to coat the spoon. Strain into the bowl, add the salt, and let cool, stirring from time to time. Refrigerate until cold or, preferably, overnight. Melt the chocolate in the top of a double boiler or a metal bowl set over a saucepan of barely simmering water. Pour the milk and cream into a large saucepan and heat over medium-high heat until warm. Reduce the heat to medium, whisk in the melted chocolate, and heat until just below a simmer. Meanwhile, whisk the sugar and yolks in a medium bowl until slightly thickened and the whisk leaves a trail. Slowly, whisking constantly, add about H cup of the hot liquid to the yolks, then whisk in the remaining liquid. Set a ﬁne-mesh basket strainer over a clean saucepan and strain the liquid into the pan. Prepare an ice bath in a large bowl. Set a medium bowl in the ice bath; have a strainer ready. Put the saucepan over medium heat and cook, stirring constantly and scraping the bottom and sides often with a wooden spoon, until steam begins to rise from the surface and the custard thickens enough to coat the spoon. Strain into the bowl, add the salt, and let cool, stirring from time to time.